We’ve added a “verified accounts” column to our Twitter friends tool – thanks to ScraperWiki user Delfin Paris for suggesting this. The 1 means it is a Twitter verified account, 0 means it isn’t. You can sort by that column to find all the most notable accounts that are following someone. For example, ScraperWiki has 44 followers who are verified users. Here’s a few, as you can see, they’re mainly journalists! You can see how they compare to our other users in this chart which plots the number of followers an account has along the horizontal axis and the number they follow on the vertical axis. The verified accounts are shown as orange dots. 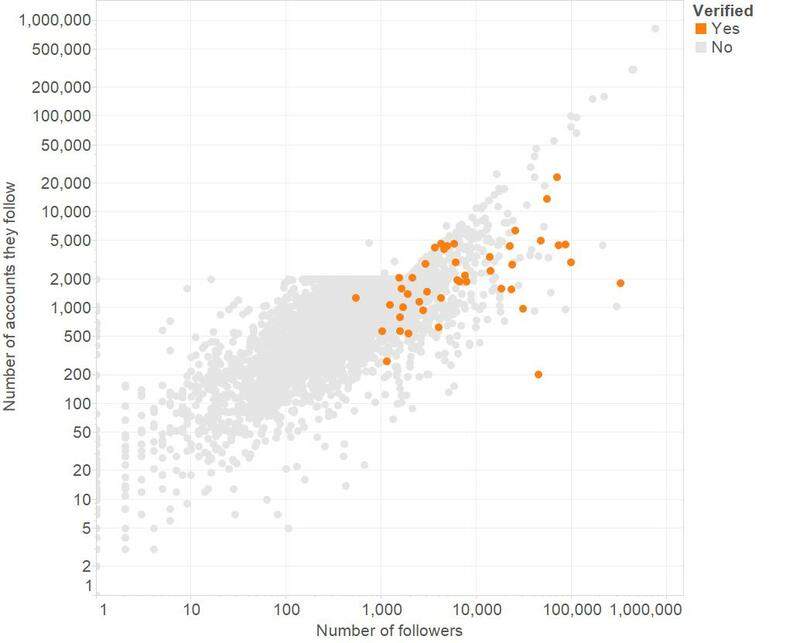 This plot shows that on average verified accounts have more followers than unverified ones. There’s nothing to do to turn it on for new users that you’re scraping. If you’ve previously scraped a user, you’ll have to clear them and start again to add the verified column.